Gesualdo di Venosa or Gesualdo da Venosa (March 8, 1566 – September 8, 1613) was a fine musician: a virtuoso lutenist and a composer. However, he is an example of what I would call the tormented self. On October 16, 1590, Carlo murdered or had servants murder his wife, Donna Maria d’Avalos, the daughter of the Marquis of Pescara, and her lover, Fabrizio Carafa, the Duke of Andria. He also murdered or had servants murder his second son because he suspected the little boy was the son of the Duke of Andria. Moreover, to avoid revenge, he murdered or had servants murder his father-in-law, the Marquis of Pescara. Gesualdo had married Donna Maria d’Avalos in 1586 and, although others knew about the affair, he did not. When he was apprised of the relationship, he made believe he was going on a hunting trip, had keys made, and caught his unfaithful wife and her lover in the act. The murders took place at the Palazzo San Severo in Naples. As an aristocrat, Gesualdo was immune from prosecution, but, for his own protection, he nevertheless settled in Ferrara for a few years to escape vengeful relatives. Moreover, in 1594, Carlo married Leonora d’Este, the niece of Duke Alfonso II. We have discussed “l’humaine condition,” or the duality of human beings. Remember that Pascal thought humans were both grands and misérables. We are mortals, which belittles us, but we know that we are mortals, which gives us nobility. Each one of us is a “roseau pensant” (a thinking reed). Michel de Montaigne (February 28, 1533 – September 13, 1592) described humanity in similar fashion. So did Descartes (31 March 1596 – 11 February 1650). However, although these writers spoke of humankind’s duality, that duality was not the juxtaposition in one individual of a good human being and a bad, or beastly, human being. No, the concept of duality does not point to the kind of division that is the fate of fictional werewolves or the loup garou, humans by day, wolves by night. However, Robert Louis Stevenson‘s (13 November 1850 – 3 December 1894) The Strange case of Dr Jekyll and Mr Hyde, first published in 1886, is a mostly human (as opposed to Beast Literature’s lycanthropy) version of a loup garou story. Moreover, there is a mental disorder called clinical lycanthropy and all of us have heard of split personalities. As for Carlo Gesualdo, I do not see in him a split personality but I do see insane jealousy and uncontrolled anger: rage. In other words, we may be looking at a non-fictional “tragic flaw” that has fascinated generations. It does not seem possible that Gesualdo, an artist, would kill or order servants to kill on his behalf. First, Gesualdo was Principe da Venosa, a prince, as well as a count, the Count of Conza. Unspeakable crimes have been committed by aristocrats, but we tend to believe that, as aristocrats, these persons are or should be morally equal to their rank. There was, however, a Marquis de Sade (2 June 1740 – 2 December 1814). He was an aristocrat, but he was not immune to prosecution. Second, the Principe de Venosa and count of Conza was a musician. He was a virtuoso lutenist and an excellent composer. It is difficult to reconcile musicianship and cruelty. In fact, Gesualdo’s second marriage was not a happy marriage. It appears he was an abusive husband, but despite her family’s entreaties, Eleanore would not divorce of husband. She tried to help him, but some believe that she ended up murdering the murderer. It all seems a mystery. 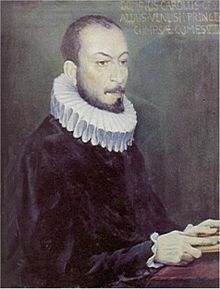 But the deeper mystery lies in Gesualdo’s ability to continue playing and composing music after the murders. How could he write and play music after committing horrible crimes? Music requires sensitivity, not to mention serenity. So we will never know what happened to Gesualdo. Again, it all seems a mystery. Could it be, for instance, that his music reflects a tormented and guilt-ridden soul? We will listen to some of his compositions. His music is very ornamented and chromatic (he used semitones, the smallest space or interval between two notes). As well, he composed complicated polyphonic works, using up to seven voices. Responsoria et alia ad Officium Hebdomadae Sanctae spectantia (6 voix). Gesualdo 1611.